Okoawo BlueGate: The Planning and Execution OfJustice Azinge Kidnap : 3 Police officers Arrested, another on the run. The Planning and Execution OfJustice Azinge Kidnap : 3 Police officers Arrested, another on the run. 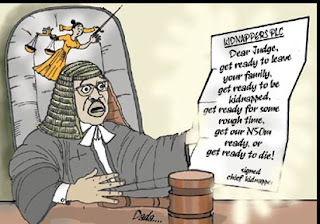 LAST week, Newspapers published story of a judge of a Delta State High Court, Otor-Udu, Justice Flora Azinge, who was prevented from sitting for two months by kidnappers. She was sent a letter for N20 million ransom by a kidnap gang. Accusing fingers were pointed at her police orderly and other police officers, currently cooling off in detention. Following our super story, Justice Azinge has resumed sitting. She started sitting on Wednesday, November 28. This is a follow-up. THE police in Delta State have seized three police officers in connection with the N20 million-ransom demand from a judge of the state High Court, Justice Flora Azinge, which went awry. The fourth police officer is on the run and the police have mounted a manhunt for him. The judge declined to speak with Sunday Vanguard when we met her, on Monday, November 26, in her court. She did not sit on that day, but two lawyers, national chair of the Human Rights Defenders Organization of Nigeria, HURDON, Sir Casely Omon-Irabor, and national coordinator of the Forum for Justice and Human Rights Defence, FJHD, Barrister Oghenejabor Ikimi, disclosed that she started sitting on Wednesday. Further investigations showed that the police officer, who was caught by soldiers when he came to pick the N20 million ransom, left his beat at the Federal Prisons, Okere, near Warri, between 10.00 pm and 1.00 am. He was said to have begged an army captain to forgive him when he was caught, pleading that it was the handiwork of the devil. Interestingly, he later changed his story, saying he was only passing by at that time. But, he has not been able to give convincing reasons to police authorities on why he left his beat at that time. His colleague, whom he left behind at the beat, gave statement to the effect that he left his gun and did not tell him where he was going. Our dependable source said, “The police officer in question is known as The Don in the kidnap syndicate that wanted to fleece the judge. He introduced himself as The Don and called both the judge and her husband, Mr. Richard Azinge, on several occasions, threatening that harm would come to her if the N20 million ransom was not paid. “On the day in question, not knowing that soldiers had been alerted, he was told by the husband of the judge on phone that he had collected the money from the bank, but could not come to Hospital Junction, Ekpan, to deliver the money as instructed because he was afraid. He begged to give the money to his houseboy. It was a Wednesday evening. “The houseboy turned out to be an army officer, who was instructed on phone where to bring the money to. At Ekpan, the houseboy was told to go proceed to Ugbuwangue market and warned that he was under watch and in the market, he was told to go to a particular broken-down trailer parked somewhere on the roadside, this was between 7.00 pm – 8.00 pm and drop the money in a bag by the back tyre of the trailer. He also told the houseboy to pack grasses by the side and cover the loot”. The source further revealed: “The Don told the boy to hold the phone very close to his ear. After he confirmed that the houseboy had dropped the ransom, he ordered him to leave the area immediately and switch off his phone. He (The Don) not only switched off his phone, but also wiped out all the calls that were made. “He, however, did not show up at the venue to collect the ransom until about 10.00 pm or so when he left his duty post. It was learnt that as he bent down and lifted the ransom bag, one of the army officers, who laid siege to the area, accosted him and that was how the bubble burst. “As a police officer, he understood the gravity of any text message relating to the judge being found on his phone, so he ensured everything was wiped out to obstruct any trace”. But Commissioner Aduba said whether his calls were wiped out or not,does not matter, as he was waiting for the call history from the service provider. The police orderly that was the first to be seized also played a very fast one on the judge and her family when the whistle was blown. Those who brought the ransom demand letter left it at the gate of Azinge’s compound and, when the house cleaner brought the letter to her madam, she told her a boy delivered it, but when she asked him whom the sender was, he told her the judge would know after reading the letter in a foolscap paper. Unfortunately, when the judge read the letter, she did not know the sender. It only compounded her day, as the kidnappers left a phone number, which they said would call her later to give her details of how to pay the ransom. The judge reported the matter to the police in Warri and was advised to do same in Asaba. It was after this that a man, who identified himself as the leader of the group, The Don,called to tell her that the gang was aware that she went to the police and was just returning from Asaba. She was told not to put her trust in the police or she would live to regret it. “He called up to nine times on Saturday. Madam did not pick the call. On Sunday, he called up to five times. It was just by a stroke of fate that a member of the household suggested that they should call one of the numbers, an Etisalat line. They did”, Sunday Vanguard source narrated. “Behold, it was ringing within the compound. It was traced to the police orderly, who did not pick. The husband of the judge did not believe when he was told and he had to call the number himself. It rang but the orderly still did not pick it and he lured him to do some work in his car, where the phone rang severally. The orderly checked the phone, as it was ringing nearby, but did not answer the call”. After the incident, the police orderly hid the Etisalat line and, by the time they were invited by the Area Commander, Warri, over the incident, the phone was missing. He initially said it belonged to his brother, that the said brother had traveled and, later, that the phone was lost. The driver of the judge was overheard by another aide telling somebody on phone that the judge is rich and they would make money if they kidnapped her. This was after he sighted some documents relating to financial transaction regarding to her father’s estate, of which she is the administrator, in her possession. The judge was alerted and she confronted the driver. He and another former driver of the judge were arrested, but the latter was later released. It was days after the police orderly was arrested and it looked as if nothing was forthcoming from the investigations that The Don continued with the ransom demand and was entrapped by the army. Before then, the orderly did not know that he would be detained in Asaba and parked his car in front of the compound of the judge in Warri. The police asked for the keys of his car, which were seized, but before they could get to the car in Warri, somebody had removed it from where it was parked. It was suspected that at that time, the phone and other incriminating evidence could still be in his car; to play safe, he reportedly called a member of the gang to remove the car. In the course of our investigations, we discovered that a police officer, said to be supplying guns and bullets to the syndicate, has gone AWOL – on the run. He was described as the police armourer, but Commissioner Aduba, who confirmed that the said police officer was actually on the run, said he was not a police armourer, but somebody attached to the armoury. An intriguing thing about all the police officers involved in the sour deal, including the driver, is that they are all from Agbor and Abavo, Ika axis of the state.